1. Which String is which? Each string has a different name but it may be difficult for you to know which string is which. The following diagram should help you but if it doesn't, contact us. You might not know which of the tuning pegs corresponds to each string but that's why we're here to help. 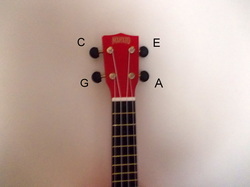 The following image shows each tuning peg and the letter beside each peg indicates which string it corresponds to. 3. How do i know which way to turn the tuning pegs? The tuning pegs turn different directions. The G and C tuning pegs turn up to tighten and down to loosen while the E and A tuning pegs turn down to tighten and up to loosen. 4. How do i know when my ukulele needs to be tuned? Most people know by ear whether their ukulele needs to be tuned or not. Even if one of the strings is only a little bit off, you will hear it. 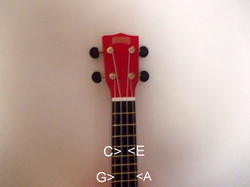 If you are ready to learn how to tune your ukulele, click here.